Maps - Call of Duty: Black Ops Guide! Maps are the battlefields where the player and his team (except in Free-For-All) battle enemy players, or Zombies in Nazi Zombies. 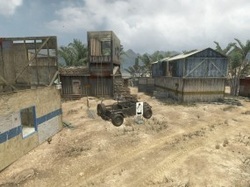 There are various elements in these battlefields, ranging from a snowy map, such as Discoveryfrom Call of Duty: Black Ops, or a desert scenery, such as Rust from Call of Duty: Modern Warfare 2. Maps can even involve Zombies such as in Nacht Der Untoten, or Space Monkeys in Ascension.